col-lage/ n. 1. a form of art in which various materials (e.g., photographs, pieces of paper, matchsticks) are arranged and glued to a backing. 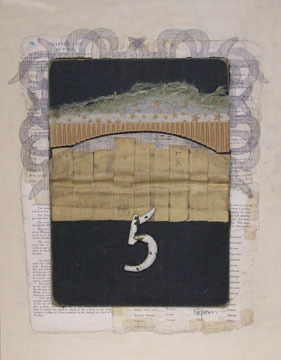 2. a composition of flat objects, as newspaper, cloth, cardboard, etc., pasted together on a surface and often combined with related lines and color for artistic effect. 3. a work of art done in this way.